No floor lasts forever, they all have a life expectancy, depending on material, traffic, and maintenance. Getting the maintenance done when it’s needed is an essential ingredient in having a floor last as long as possible. For some floors, this means stripping off the wax and sealer layers and replacing them periodically. Sealer and wax have a job to do – protect your floors from the wear that traffic causes. Over time, they wear away from traffic, and need to be replaced. Having this done before they are worn enough to expose the flooring material to damage is essential to the life of the floor. Before applying a new coat of sealer to a floor, it’s necessary to totally remove all traces of the previous sealer and wax. 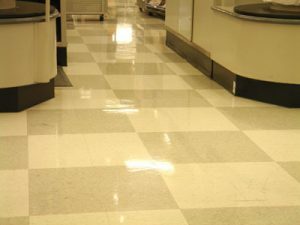 This process will also remove all dirt and grime from the floor, leaving the floor perfectly clean but unprotected. Our floor maintenance professionals are trained to know which type of stripper is best to use on the various flooring materials. The sealer’s primary function is to provide a barrier between your flooring material and anything that may spill onto it and stain it. A floor without a properly-applied sealer is vulnerable to stains and excessive wear from traffic. Our professionals have the skill to apply sealer evenly in the proper thickness for optimum life, and the knowledge to choose the best sealer for every floor type. After the sealer has completely dried, we can move on to the next step. Wax doesn’t merely give a floor a lustrous, beautiful appearance, it also protects the sealer layer from wearing away under traffic. In high-traffic conditions, several coats of wax may be needed to protect your floor and its finish. The skilled floor-care technicians of Smitty’s Janitorial Service can recommend the ideal number of coats, depending on how much traffic your floors need to be protected from. We also have the experience to know which wax is best for your conditions. 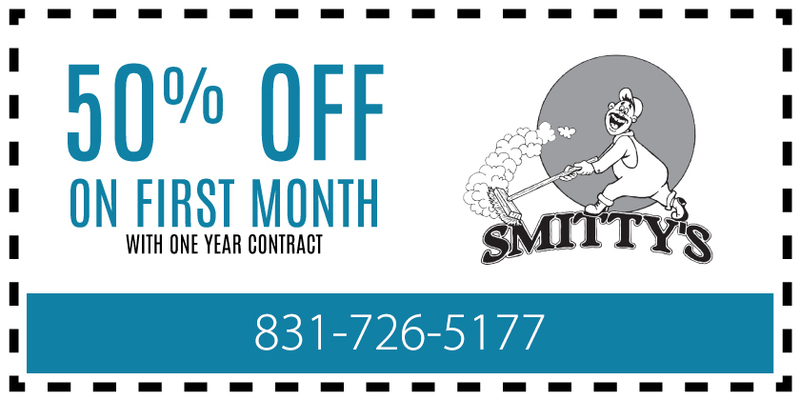 Here at Smitty’s Janitorial Service, we have years of experience in maintaining floors of every type, under all business traffic conditions. We are prompt, professional, and can handle any floor size, at a time that is convenient for you. Ask us for a quote today and make certain that your floors get the maintenance that they need to last as long as possible, and look as beautiful as they can.